A concise, single story of heroism and stupidity. 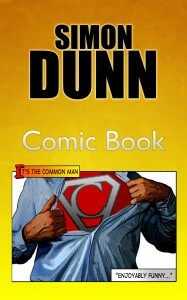 John Smith, an alien from another planet, landed in Canon City and immediately realised he was a superhero. He is The Common Man, tolerated by the citizens and mocked by the villains. In five tight chapters, he leaps tall buildings, saves an out of control bus, and destroys a house with an unfortunate bodily excretion. A Kindle exclusive from Amazon.